Ooops! What happens when you accidentally enroll in monster school? Tsukune Aono is a painfully average high school freshman who is unable to get into any private school due to his disappointing test scores. The only school he is finally accepted into turns out to be a secret school for supernatural monsters (y`kai), who are in disguise as humans. The first student he meets is the beautiful Moka Akashiya, who becomes his friend for an unusual reason; she is a vampire, and is attracted to the sweet taste of his human blood. 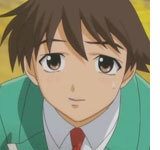 Tsukune quickly realizes his mistake that this is definitely *NOT* a normal university and fears for his life. 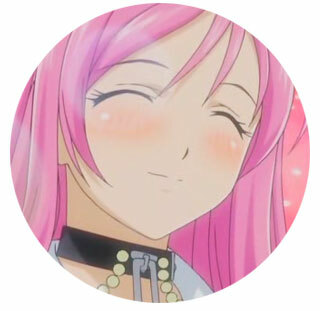 Despite Moka's vampiric nature, she is a kind girl (and an absolute knockout!) 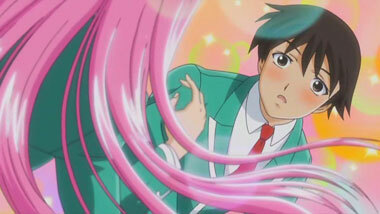 and Tsukune quickly falls for her. He decides to stay and be near her, despite the various dangers. He must hide his human identity from the faculty and other students, while trying to keep his grades up and avoiding conflicts with the various not-so-mythological monsters lurking around campus. Tsukune soon discovers that when he removes the "rosario" around Moka's neck, she transforms into a super-vampire, stronger and more powerful than almost any other creature at the school. However, in this state, she has an entirely different personality, often cold and merciless, so the rosario is only removed in dire emergencies (which seem to come up more often than you'd think). 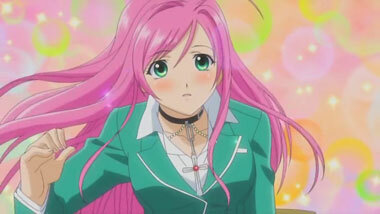 Rosario + Vampire is a cute romantic comedy with a twist. Blending elements from many other anime shows, it's familiar enough to follow but different enough to keep you watching. Very appealing character designs and plenty of sexual tension make this one vampire we'd like to be bitten by. 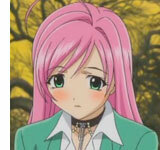 Below: Scenes from Rosario + Vampire. 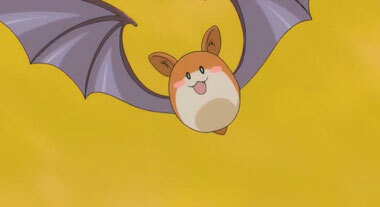 Below: The opening titles to Rosario + Vampire Capu2.